If you're going to say that Disney's Big Hero 6 is an adptation of Marvel's Big Hero 6 just because it features a boy and his robot and their super friends, then you might as well say Sky High is an adaptation of X-Men because it features superpowered high schoolers. Baymax cares. That's what he was designed to do. The plus-sized inflatable robot's job title is technically Healthcare Companion: with a simple scan, Baymax can detect vital stats, and, given a patient's level of pain, can treat nearly any ailment. 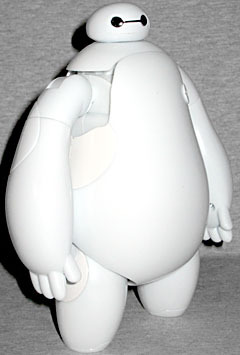 Conceived and built by Tadashi Hamada, Baymax just might revolutionize the healthcare industry. But to the inventor's kid brother Hiro, the nurturing, guileless bot turns out to be more than what he was built for - he's a hero, and quite possibly Hiro's closest friend. 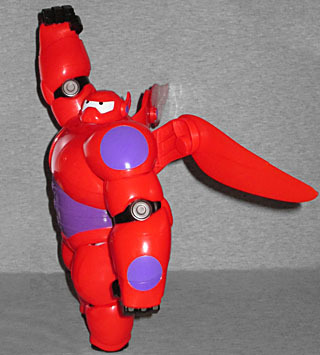 And after some deft reprogramming that includes a rocket fist, super strength and rocket thrusters that allow him to fly, Baymax becomes one of the "Big Hero 6." 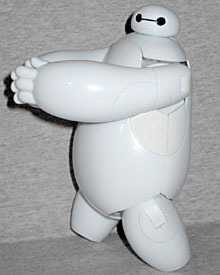 In the comics, Baymax was built by Hiro himself, and has three modes: his default is best described as "tall Oddjob," but he can also change into "Battle-Dragon" and "Action-Mecha." In the movie he's a balloon that cosplays Iron Man. We're not saying it's bad that Disney changed things - more people will read this review than read the original comic when it came out - we're just acknowledging that there are differences. Obviously there's no way a plastic toy could be duplicate the character's inflatable nature, but the sculpt is at least nicely rounded. His body looks like a potato, and his head is a small, flat bubble on the shoulders. The arms are bloated tubes that end in broad, sausagey fingers, and his super short legs - only about twice as tall as his head - terminate in flat stumps rather than any recognizable kind of foot. He has two circular black eyes connected by a thin, straight line, and there are reinforced panels on his hips, armpits, and elbows - you know, the places he'd flex the most. There's a raised circle on the left side of his chest, with an angled line running through it. 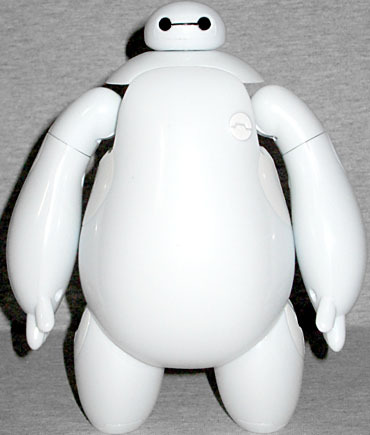 Baymax has a swivel neck, and swivel/hinge shoulders and hips. That's not a lot of articulation on a 6" figure, but then, it's from Bandai - they're not exactly known for making mobile toys. Also, there are a lot of visible screw holes all over his back. It's kind of what they do. Just remember, these are kids' toys from a kids' movie: if someone were making high-end collector's editions for nerds like us, we'd expect stricter standards. But for this? It's fine. Besides, you're not getting this figure for his amazing articulation. 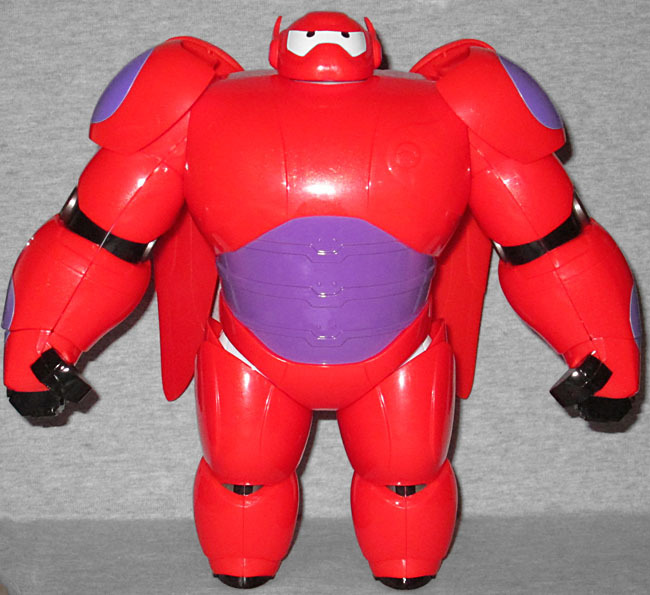 No, you're getting this because he's Armor-Up Baymax, and you want to armor him up! The figure comes with 19 pieces of armor that fit over his existing body. This isn't a case where you have to disassemble the main figure and then plug in new parts, it's all a shell that fits around him. The pieces include: a helmet; chest and back armor; wings; two sleeves; shoulder pads; gloves; boots; and thigh armor. In his armored-up mode, Baymax stands a massive 8" tall. His articulation is slightly hampered by all the gear he's wearing, but it's not like they just did it as two complete halves that lock him into a single pose either. There's some wiggle room in there. And hey, the wings have a joint in the middle, so they tuck away or spread wide. 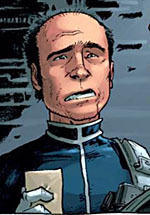 Baymax is voiced in the film by Scott Adsit, which presents a rather interesting case: he's not one of those actors who have appeared in multiple comicbook movies (not that we count voiceover work anyway), but he's voicing a Marvel character and he is a Marvel character; in our world, Scott Adsit is a comedian, but in the 616 reality, Scott Adsit is an agent of SHIELD. Most unusual! Big Hero 6 isn't a Marvel movie. It's a Disney movie. 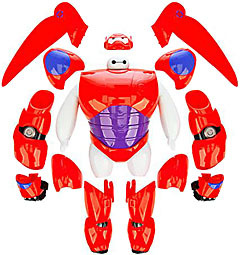 And Armor-Up Baymax isn't a Hasbro toy, he's a Bandai toy. So we can't expect Marvel Legends quality, because there's not going to be a Marvel Legends Baymax. The most we could hope for (since the Disney Store doesn't seem to do awesome exclusives anymore) is that there will someday be a Figma or Revoltech version of him, but who knows when/if that'll happen. For action figure fans, Armor-Up Baymax is the best.